As many of you are aware, AOL recently killed their AOL Radio contract with XM Radio, in favor of partnering with CBS Radio. AOL and AIM users can access broadband-quality streaming music for free which will give them access to 200+ online radio stations. The AOL Radio platform is rather simple in nature and it appears AOL has completely abandoned their own internal development and simply outsourced the project to CBS in their “Play.it” service. No matter which way you slice it, the Flash-based audio player is very easy to use, simple and functional. 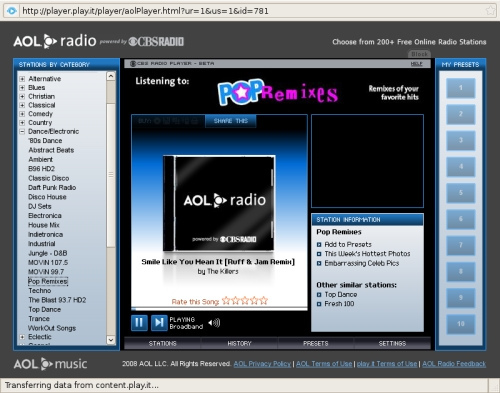 AOL Radio Sounds great on Linux, the beauty of Flash. The menus are very simple but oversaturated though with so many stations. I guess that is a good thing because I will subconsciously know there is a wide variety. Historically, AOL kept their XM stations isolated into the “XM” folder; looks like they sufficiently blended it into their categories. I did experience one frustration when finding local radio stations. It’s difficult because not everyone knows the frequency and the call sign of their radio station. There needs to be a taxonomy structure like “Southwest > Arizona > Phoenix > 101.5 JamZ,” but there isn’t. AOL Radio is being powered by CBS Radio’s Play.it service, and like I said, it appears AOL has abandoned their own media player in favor of getting the new content online. I fail to see any monetization of the service (ads), which concerns me that they are making it ad-free for now and will hurt their users later with in-stream audio ads. On the AOL Radio Blog, they experienced the same flow of complaints from passionate users along with providing the typical clear cache and reboot routine. One of the mistakes AOL Radio made every time they changed platforms is not transferring user-set presets. They should have applied an extra effort to port the presets over to make the transition as seamless as possible. It’s just upsetting to see users pitch a fit over such a simple complaint. As expected, there is a lot buffering issues, especially within the AOL client, but those will subside, but I didn’t experience any. What do you think think about AOL Radio?